Prints of all of my photographs, graphics and originals are for sale under different conditions. For the moment I'm only listing here a few chosen items, but please contact me if you're interested in any other artwork shown in this website. All prints are high quality giclee prints, produced using archival papers and pigment-based inks which ensure maximum durabilty. It has been said about this stunningly realistic image that: "It would make a perfect symbol for a feminist revolution". It certainly does make for a strong statement, although the multiple layers of meaning are not consigned to the purely feminist. 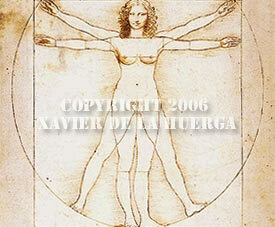 A knowledge of the background behind Leonardo's original es necessary to fully understand it. Click here to read more. These prints are artificially and carefully "aged" using tea, beeswax, heat and other techniques. They are also artistically enhanced with ink, pencil and gold leaf ornaments, calligraphic textures, neo-alchemical emblems, sigils and my personal seal; making each of them a completely unique specimen. Prices start at £33 ($50 approx.) Depending on individual finish and size. They are produced on high quality archival paper (A6 to A3+ approx.) using pigment-based, light resistant inks. Please get in touch via email for an up to date catalogue. Click here to view some close-up samples. 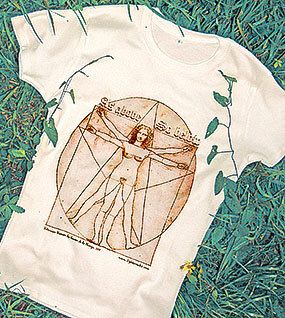 Vitruvian Woman Signature T-Shirts - Lovely quality, direct-to-fabric printing method, 100% thick white cotton. This exclusive design bears the hermetic dictum "As above, so below" written in a gothic style font plus the venusian/pythagorean pentacle gracefully integrated within the overall design. Available in Lady-Fit and Unisex Loose-Fit models in any size. Price: £23 plus £3 p&p for the UK. Please, send me an email to contact@lightcracks.com to order directly and with total confidence. To order T-Shirts from outside the UK. There will be dedicated links for Europe and the rest of the World soon. If you can't wait and are outside of the UK please contact me via email. Price is the same as for the UK after currency conversion but postage and packaging charges might be different. Same image as for the T-Shirts. Very limited edition of 33, with numbered label. 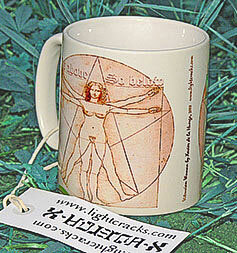 Please, send me an email to contact@lightcracks.com to order directly and with total confidence. Price: £13 plus £2 postage and packing for both UK and Europe. Delivery times might be up to 7 days. Rest of the world postage fees and delivery times might possibly vary. Please contact me via email if you have any questions. Thanks.